Paper and Fire is really good. Between it and the first book, Ink and Bone, this book series has shot up to my favorite novels that I've found this year. Paper and Fire picks up about six months after Ink and Bone leaves off but it works really well. In terms of story development nothing major has happened in between but it starts kicking off right when the book begins. It's always hard to review later books in a series without giving spoilers for the earlier ones. But, I really like this series. 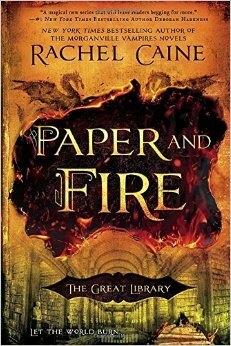 I read through Paper and Fire super fast because it hooked me and now I immediately want the next book! Unfortunately, I have to wait for it to come out since I'm already caught up. If you haven't already, you should check out The Great Library series. I'm loving it. Go grab Ink and Bone and see what you think.